You’ve put together the best presentation of your life and you feel ready to show it to the world, but are you really ready? When it comes to presenting and public speaking, there’s a lot more to it than putting together the information, crafting your message, and using eye-catching graphics. So whatever you do, don’t forget to practice these five presentation skills before your big day arrives. No one wants to sit through an hour presentation given by a monotone speaker. You need to deliver something exciting and inspiring if you want people to pay attention and remember your message. Start by practicing talking loudly, slowly, enthusiastically, and clearly. Don’t be afraid to add some variety to your speech to display particular emotions — this will help keep people engaged. When talking through a variety of topics, you need to know how to properly transition from one idea to the next. The best way to do this is to establish a primary message and build upon each idea. This will help people follow your presentation and connect the points as you transition from one topic to the next. Just be sure to keep your topics short and concise, and then circle back as you go. If you’re the keynote speaker or on a panel, it’s likely you’re going to need to answer questions at some point. 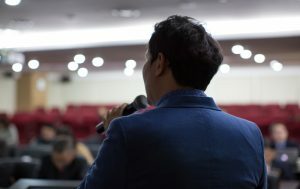 To avoid stumbling over your words, practice thinking on your feet and improvising through some of the tough questions that you would ask a similar speaker on the topics being covered. Ask any professional speaker, and they’ll have a few horror stories to tell. They’ll also tell you to be ready for anything. The best way to do that is by practicing how to react to problem scenarios, like when the mic cuts out, the presentation screen freezes, or there’s a medical emergency. Whether it’s the mic, the clicker, or your presentation software, you need to know how to download it, fix errors, and play it on a variety of devices. If you’re using the latest tech for your presentations to make a lasting impression, you should bring some handouts and a backup plan in case something breaks, fails to open, or refuses to work. St. Elias Centre has all of the state-of-the-art equipment you need, helpful event staff, plus a number of flexible rooms to suit your event size requirements. We can also provide onsite catering and ample parking to impress and accommodate your audience. When you’re ready to take your presentation game to the next level, contact us at St. Elias.